When you’re looking to complete your family with a furry friend, make sure to consider the Yorkshire terrier. The most popular toy dog breed in the U.S. today, according to Dogtime, Yorkshire terriers are both elegant and devoted dogs that make fantastic pets. Let’s take a look at what makes these pups so unique and appealing. Yorkshire terriers were used in the 19th century to catch rats in clothing mills, says the American Kennel Club. This breed originally was popular with members of the working class – especially among weavers – but eventually left the workforce to become a companion animal to families of European high society. 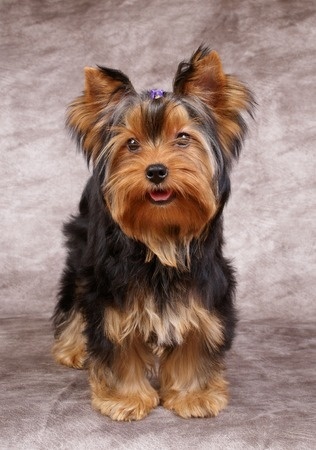 Yorkshire terriers have a long, silky coat with perfectly straight hair. They also tend to shed very little. When born, Yorkie puppies are black, with a blue and tan coat that develops gradually over time. The hair as they age develops a dark steel-blue color that has a distinctive bluish sheen when looked at in the sunlight. Their faces tend to have a much lighter, goldish color, while the coloring of the fur on their legs tends to be tan. Though inconsistent in size, Yorkies usually weigh no more than 7 pounds, but it is not unusual for Yorkies to range in size from 4 to 15 pounds. Yorkies are often described as big dogs in small dog bodies as they have an insatiable urge for adventure. These pups are affectionate towards their own people, but can be suspicious of strangers and will often bark at strange sounds, strange dogs and intruders. Early socialization in the form of exposure to many different people, sights, sounds and experiences can help ensure your Yorkie is both friendly and well-rounded. Yorkies display a range of personalities from cuddly and perky to mischievous and outgoing. Though they come across as bold, Yorkies need lots of attention and time with their family, and being left alone for long hours is not good for them. Though over-protecting your dog isn’t the answer, making sure you check in on them throughout the day, if possible, can prove helpful to ensuring that they aren’t overly stressed. With their unique and charming personalities, Yorkshire terriers are both happy and amusing pets. Though traits between individual Yorkies, in general, this breed is known for its intelligence, courage, independence and energy, says YorkieInfoCenter.com. Some odd quirks could include rolling in the grass, hyperventilating, being overly shy and more. Yorkies will often get along well with other dogs and cats they were raised with, but they may become possessive of their owners if a new pet is brought into the house. As a terrier, they may challenge any new animals and may even want to fight to the death, if provoked or if they feel threatened by the new pet, so proceed with caution when introducing new animals to the household. Thinking about adding a Yorkie to your family? At Pauley’s Pups, we specialize in toy breeds – including the Yorkie – and can help you find the perfect new friend to add to your home. To learn more or to find out more about the puppies we have available, give us a call today at 804-798-7877.